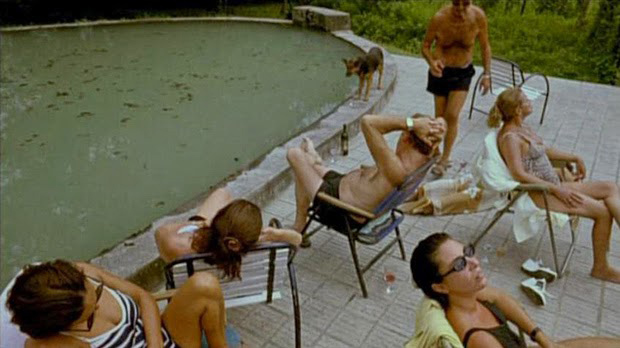 We often think of water as an element that cleanses and purifies, but in the films of Lucrecia Martel, it festers and corrodes, floods and fogs, it leaks in from every crevice, and gets under your skin. Often situated at the crest of the so-called wave of New Argetine Cinema, Lucrecia Martel’s work marks a prominent ripple within a generational swell inextricably linked to the recent economic crisis. Hailing from different regions and social circles, it is perhaps more productive to unify Martel’s work with that of her compatriots under shared concerns and overlapping political agendas. But even amongst filmmakers such as Lucia Puenzo and Pablo Trapero, Lucrecia Martel’s cinematic sensitivity stands out, for the ubiquity of these diverse filmmakers lies not in their stylistic coherence, but rather in their global appeal underpinned by an intrinsic national spirit, and in their ability to circulate international waters on a strong understanding of Argentine culture and tradition, however provincial or nomadic. Short of any establishing shot to narratively or even spatially situate the viewer, Martel’s debut feature La Cienaga (2001) thrusts us into an overwhelmingly complex atmosphere of strenuous sounds and a tangibly desolate mood. The grey and overcast sky adamantly disappoints our expectations of what a tropical summer in Northern Argentina might look like, while the rusted lounge chairs buckling under the weight of these languid and sluggish bodies struggle to fit our fancy of sunbathing at a countryside villa. Even the film’s title card is distorted by the pervasive murkiness that oozes from the wilting walls of their summer home. While the sound of thunder somewhat justifies the debilitating effect of what we assume to be heavy humidity and unfortunate weather, the distant crashes are drowned out by an excruciating clawing of metal against concrete, as the lifeless subjects drag their chairs away from the poolside and closer to a table overflown with alcohol. Maybe it’s the moisture in the air, or maybe it’s the cheap drink, but something is definitely rotting the insides of this overbearing atmosphere. The lethargic guests bear uncanny resemblance to monsters from a B-horror movie– awaken by the sound of ice clinging against a freshly poured wineglass like zombies drawn to live flesh. While we may not be privy to the intention of this seemingly misguiding introduction, Martel carefully lays the visual and aural groundwork for the themes of social malaise and sheltered privilege that will continue to brew underneath the film’s surface. The first character that we are formally introduced to is Mecha– hardly the film’s protagonist, though grandiosely delusional about her role as a less-than-glamorous housewife whose good-for-nothing husband barely lifts a finger around the house, let alone run the family pepper business (that’s not code for something more exciting. They literally make a living selling red peppers). If first impressions go a long way, then our acquaintance with Mecha is tainted from the first time we see her drunkenly stumbling along the poolside with too many glasses in her hand for someone at that level of intoxication. Then again, it’s hard to imagine different circumstances under which to meet someone whose sole motivation for getting up in the morning stems from fear of her snarky daughter’s remarks that she will spend the last ten years of her life bedridden the way her mother did. Even after the booze wears off and Mecha is dismissed from the hospital with nothing but a measly stomach pump and a handful of stitches, her unproductivity suggests that not even fear will save her from this unfortunate prediction. But alcoholism isn’t the only, nor the most dangerous vice, stirred up by this exasperating cesspool. If too much rain and too much liquor created a relatively docile circle of zombie-like adults, the effects of boredom, repressed sexuality, and carelessness are bound to stir up their restless and painfully idle children. Inheriting their mother’s knack for killing time, José, Verónica, and Momi live a dissipated lifestyle plummeted in rampant incestuous desire and detached ennui. The younger siblings, not yet depraved by this carnal intimacy, diffuse the buildup of energy through their own outlets of rowdy shenanigans up in the mountains. Unaccompanied and unsupervised, the boys whip their machetes and fire their riffles, while their unlicensed sisters drive frantically to and fro the hospital as if risk were a necessary coping mechanism for this cripplingly apathetic family. These potential damages seldom come to fruition and are easily forgotten and dismissed by the perpetrators–only the audience is left with queasy traces of what could’ve happened. In fact, every character seems to deal with the world through complete oblivion of what goes on outside their individual bubbles. Everyone is too self-absorbed to notice that they’re playing with fire. Whether it’s Momi’s unrequited obsession with the maid, Vero’s flirtation game with her brother, José’s secret affair with his father’s mistress, Gregorio’s hair-dying attempt to appear younger, or Tali’s money-saving plan to shop for school supplies in Bolivia, every character is too busy dragging out their own fruitless pursuits to see the bigger picture. It’s no coincidence that the only character that bears any inkling of sanity is the one who is constantly accused of theft and temptation by the rest. Isabel’s lack of sympathy for the imprudent family she serves is Martel’s way of giving the lower class an upper hand. Mecha and her family not only expect Isabel to do her job, they also expect uncontested affection and blind devotion to the household despite their exploitation of her. They don’t just pay her to work, they pay her to care–though judging by Isabel’s indifference, I suspect her meager salary doesn’t afford them the latter. The tension between social classes evolves from its nuanced form in La Cienaga to a major aspect of Martel’s subsequent films, and becomes most prominent in The Headless Woman (2008). But before I get to the last installment of Martel’s unofficial trilogy, The Holy Girl (2005) marks a necessary step in between these social bookends. As suggested by its title, The Holy Girl is Martel’s most direct critique of religious hang-ups and the over-sensational hold of Catholicism on a young girl’s self-discovery. Set in the same rural town as La Cienaga–a fictionalized version of Martel’s native province Salta–this film pulls questions of faith, salvation, and vocation from the fringes of her previous work to its narrative center of attention. The dingy hotel in which most of the action takes place is undoubtedly in better shape than Mecha’s decaying villa, though it too has seen better days. Imbued with similar familial dysfunctions and sexual arcana, The Holy Girl is saved from the bitter aftertaste of its predecessor by the unusual voyeuristic point of view it adopts. We are held in the position of curious accomplices to fourteen-year-old Amalia, rather than that of moral onlookers forced to reckon with the corrupted adults. For the director, it’s easier to imagine the camera not as a fly on the wall, but as another character around the same age as her young protagonist–driven by a similar inquisitiveness and reacting to the diegetic cues the way any other person would. Both the camera and Amalia get so close to what goes on in their world without ever being granted full access, and have trouble following a single narrative strand through to its resolution. They get distracted, interrupted, and are unable to fully understand the people around them. The fact that they’re always spying on others evokes a sense of secrecy, of non-disclosed confidentialities, and of suffocated desires. Miscommunications and misconceptions strongly adhere to the film’s narrative–in which a hotel owner mistakes cordiality for courtship, her daughter confuses indecent sexual behavior for divine calling, and her best friend can’t differentiate between affection and vulgarity. It is no coincidence that a group of otolaryngologists temporarily reside at the hotel to give a conference on improving their treatment of the senses. Dr. Jano’s reluctance to come clean and Helena’s disavowal of her own daughter’s need for both sexual and spiritual guidance mark the incompetence of the upper middle class. But this laissez-faire attitude adopted by the adults in Martel’s films isn’t just a culture-clashing phenomenon that distinguishes Latin American parenting from the North American “helicopters” (as they’re infamously called)–rather their lack of accountability and denial of responsibility treads much deeper waters. The Headless Woman fully anchors Martel’s critique of regional issues tied to the post-dictatorship social state of Argentina. This painstakingly underrated film belongs to the ranks of Michael Haneke’s Caché (2005) and Michelangelo Antonioni’s L’Avventura (1960), for few films have so elegantly infuriated Cannes audiences for breaking the rules of cinematic narration and pushing the limits of palatable pace. It’s ironic that such an exclusive crowd was immune to the exposition of blind privilege, and the increase of denial as you move up the social ladder, that such a hierarchy exists. What is most frustrating about this film is probably the fact that the plot is so simple that it becomes alienating. We get the feeling that there’s something more; something withheld from us. Perhaps this is because of the protagonist’s unresponsiveness to the world that surrounds her. If it’s through Veronica that we attempt to make sense of what goes on, than just from the film’s title we’re warned that this source is flawed. While not literally headless, she is utterly unhinged and disoriented–consumed by the guilt of what she might’ve done and suffering from the same oneiric amnesia as her nation. Distracted by a Nana Mouskouri pop song blasting on the radio, her own reflection in the rear-view mirror, and the sound of her cellphone incessantly ringing, Veronica hits something with her car on the highway. Her hesitation to get out of the car, or even to quickly scan the damages, speaks volumes about a lifelong habit of denial and avoidance. Rather than wash away the condemning handprints smeared on the windows of Veronica’s car, the heavy rainfall simply smudges the evidence and blurs her consciousness. Martel makes us aware of the absurdities and paradoxes that occur in Veronica’s world: the recently opened public pool is the talk of the town, while Veronica’s household staff secretly excavates one deeply buried in her backyard; her zealous intrigue for the whereabouts of Changuila’s mysteriously missing brother contradicts the indifference and frivolity with which Vero treats the rest of the working class; she acts as though entitled to the care and resourcefulness of hospital nurses, her husband’s assistant, the woman who pours her coffee in the morning, and even the stranger whose shoulder she cries on in the public bathroom, yet never questions what gives her the right to do so. Veronica is completely oblivious to the extent of which her own comfort has been built on and historically reinforced by the plundering of others. Her preoccupation for the missing boy relies solely on the fact that she might be responsible for his disappearance, and is fuelled by the hypothetical impact it would have on her family’s precious status (were the truth leaked out, of course). But to suggest that Veronica is the only character who has been tainted by a national corruption would be too easy for us to dismiss, not to mention a vast underestimation of Martel’s wit. Two steps ahead of her, the men in Vero’s life carefully pick up the slack, wipe away the traces, and neatly tuck away the loose ends. By the end of the film, it’s as if nothing ever happened–which fills us with a bitter unease that, whether we like it or not, makes up for the entire film’s seeming lack of intent. The car damages, the x-ray appointments, and the hotel check-ins cease to exist. Nothing we just witnessed for the past 87 minutes was permanent enough to leave a mark; it has all been erased…taken care of. The final shot is equally distant and blurred as the introduction, though this time it isn’t through rainfall that we observe Veronica, but through the smoky glass of a fancy restaurant as she attends another elite social ritual surrounded by friends and family. If the film was at any point alienating in its uneventful and anti-climactic plot, then the nonchalant way in which the characters interact here stings. Nothing is solved, no resolutions have been made, our suspicion of the entire family’s poisonous morale has become intolerable, but only the storm has passed. Martel doesn’t separate the political from the cinematic, the narrative from the affective, the visual from the aural. Instead, she shows us how to consume and pay attention to their co-mingling and collaboration. One of our biggest fears as a society lies in that which is repressed–whether its desperation, desire, or memory–and yet Martel’s lens teases these out and weaves them into a powerful quilt of social frailty, everyday life with a tinge of local flavour, and humanity riddled with holes and ruts.